The combination of warm weather and children heading back to school creates a perfect environment for lice outbreaks, and common misconceptions about head lice may put more kids at risk. Dr. Patricia Brown, a dermatologist at the FDA, says the number of lice cases seems to peak when kids go back to school in the fall and again in January. When children play closely together, scalp-dwelling lice are given ample opportunities to move from one child to the next. Regular head-to-head contact means the threat of head lice is much greater -- and contrary to myth, lice don’t prefer hosts with poor hygiene. In fact, lice are attracted to clean, healthy hair. While you might think itching is a tell-tale sign your child has lice, experts say only about 30 percent of people itch when they have lice. The best way to identify lice is to conduct regular checks. Brown recommends checking for head lice or nits by parting the hair in several spots. To help spot the sesame-sized critters, you can use a magnifying glass and a bright light. Nits (lice eggs) tend to be easier to spot and typically look like dandruff stuck to hair follicles, Brown explained. FDA-approved treatments for head lice include both over-the-counter and prescription drugs, such as Nix and Rid -- but be sure to read the label before purchasing head lice products to treat a very young child, since many are not for use in children under the age of 2. Head lice are the second highest cause of school attendance issues in the United States – between 6 and 12 million U.S. kids get head lice each year. 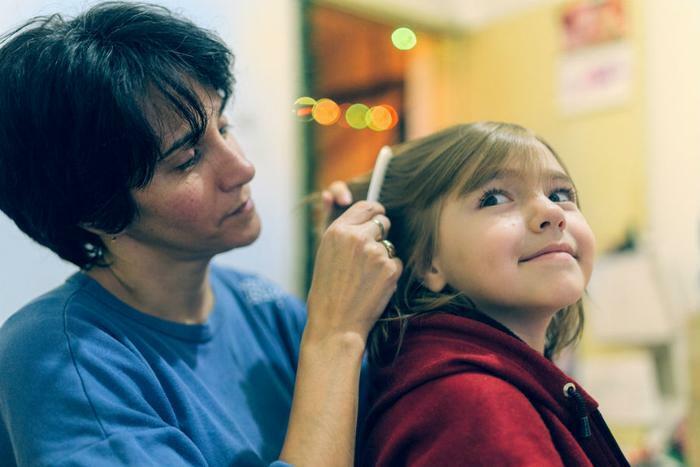 To prevent a lice outbreak, it’s important to teach kids how to avoid coming into contact with them in the first place. Teach children to avoid head-to-head contact during play and other activities at home, school, and elsewhere (sports activities, playgrounds, slumber parties, and camps) and not to share clothing, hats, hair accessories, helmets, headphones, and other supplies. Disinfect combs and brushes used by a person with head lice by soaking them in hot water for 5 to 10 minutes. Do not lie on beds, couches, pillows, carpets, or stuffed animals that have recently been in contact with a person with head lice. Machine wash and dry clothing, bed linens, and other items used by the person with lice using hot water and a high heat drying cycle. Clothing and items that are not washable can be dry-cleaned or sealed in a plastic bag and stored for two weeks. Vacuum the floor and furniture, particularly where the person with lice was sitting or lying down. After finishing treatment with lice medication, check everyone in your family for lice after one week. If live lice are found, contact your health care professional.